A severe, prolonged and harmful regional heavy air pollution episode occurred in eastern China from December 2016 to January 2017. 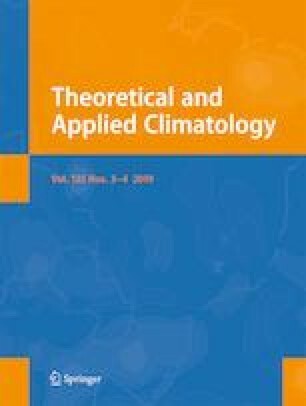 In this paper, the pollutant characteristics and the meteorological formation mechanism of this pollution event, including climate anomalies, surface weather conditions, planetary boundary layer structure and large-scale circulation features, were analysed based on observational pollution data, surface meteorological data, sounding data and ERA-Interim reanalysis data. The results are as follows. (1) Five pollution stages were identified in eastern China. The two most severe episodes occurred from December 27, 2016 to January 4, 2017 and from January 8 to 12 2017. During these two pollution episodes, fine mode particles were major contributors, and hourly PM2.5 concentrations often exceeded 150 μg/m3, reaching a maximum of 333 μg/m3 at Fuyang station. Gaseous pollutants were transformed into secondary aerosols through heterogeneous reactions on the surface of PM2.5. (2) Compared with the same period over the years 2000–2016, 2017 presented meteorological field climate anomalies in conjunction with unfavourable surface conditions (weak winds, high relative humidity, fewer hours of sunshine, high cloud cover) and adverse atmospheric circulation (weak East Asian winter monsoon and an abnormal geopotential height of 500 hPa), which caused poorer visibility in 2017 than in the other analysed years. (3) During the development of heavy pollution event, unfavourable surface weather conditions, including poorer visibility, weaker pressure, higher relative humidity, lower wind speed with unfavourable wind direction and less precipitation suppressed the horizontal diffusion ability of air pollutants. Furthermore, the unfavourable structure of the atmospheric boundary layer was the key cause of the rapid PM2.5 increase. The deep, strong temperature inversion layer and weak vertical wind velocity could have suppressed vertical motion and enhanced the stability of the near-surface atmosphere, causing the air pollutants to accumulate at low levels and exacerbating the air pollution problem. Finally, a persistent stagnant weather system with a weak geopotential height field of 1000 hPa and warm air advection at 850 hPa was the main feature of atmospheric circulation associated with the heavy pollution. This work was jointly supported by the Anhui Research Project in the Public Interest (1604f0804003), the China Special Fund for Meteorological Research in the Public Interest (Grant No. GYHY201406039), the National Natural Science Foundation of China (Grant Nos. 41705014, 41275076 and 40905046) and the Meteorological Open Research Foundation of Huaihe Basin of Anhui Province (HRM201506).